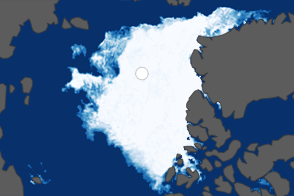 On September 12, 2009, sea ice in the Arctic Ocean most likely reached its minimum extent for 2009, said the National Snow and Ice Data Center. The reach of Arctic sea ice fluctuates through the year, growing in the winter and shrinking through the summer. In September, ice stops melting and begins to re-freeze as temperatures drop. This image shows the minimum extent for 2009 as observed by the Advanced Microwave Scanning Radiometer for EOS (AMSR-E), a Japanese sensor flying on NASA’s Aqua satellite. 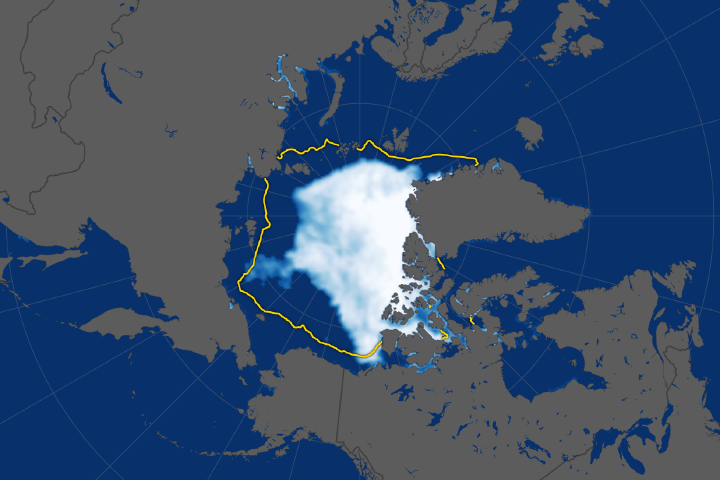 This image illustrates the 2009 minimum on September 12, when ice covered 5.10 million square kilometers (2.97 million square miles) of the Arctic Ocean. The average minimum between 1979 and 2000, outlined in yellow, was 6.71 million square kilometers. The 2009 minimum extent was 1.61 million square kilometers or 24 percent below average. According to the National Snow and Ice Data Center (NSIDC), the 2009 sea ice minimum was the third lowest since the start of satellite measurements in 1979. The only two years with less sea ice were 2007 and 2008. The graph illustrates the difference between 2009, 2008, and 2007 sea ice extent and the average extent. 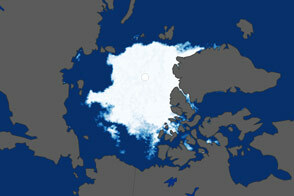 Sea ice covered a smaller area in 2009 compared to 2008 until August, at which point ice loss in 2008 surpassed 2009. Neither year came close to 2007, which was low from the start of the melt season. All years were significantly below average. 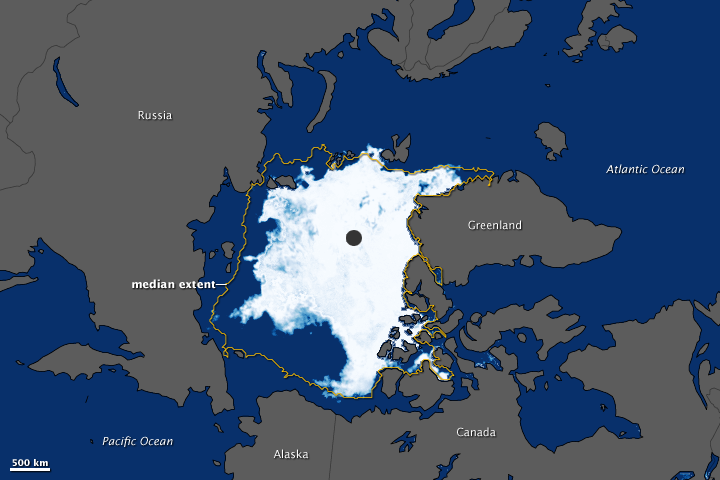 Though sea ice didn’t melt as much in 2009 as it did in the previous two years, NSIDC scientists believe that the long-term decline in summer sea ice extent will continue. Sea ice in the Arctic is now dominated by younger, thinner ice, which is vulnerable to melting, said NSIDC. To see how sea ice has changed since 2000, see the Earth Observatory’s World of Change entry on Arctic Sea Ice. NASA images created by Jesse Allen and Rob Simmon, using AMSR-E sea ice concentration data provided courtesy of the National Snow and Ice Data Center. Caption by Holli Riebeek. 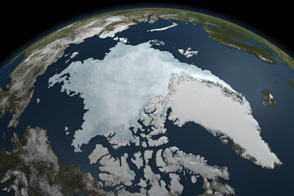 On September 12, 2009, sea ice reached its annual minimum extent, covering 5.10 million square kilometers (2.97 million square miles) of the Arctic Ocean. This image shows the 2009 ice extent compared to the 1979-2000 average. National Snow and Ice Data Center. (2009, September 17). 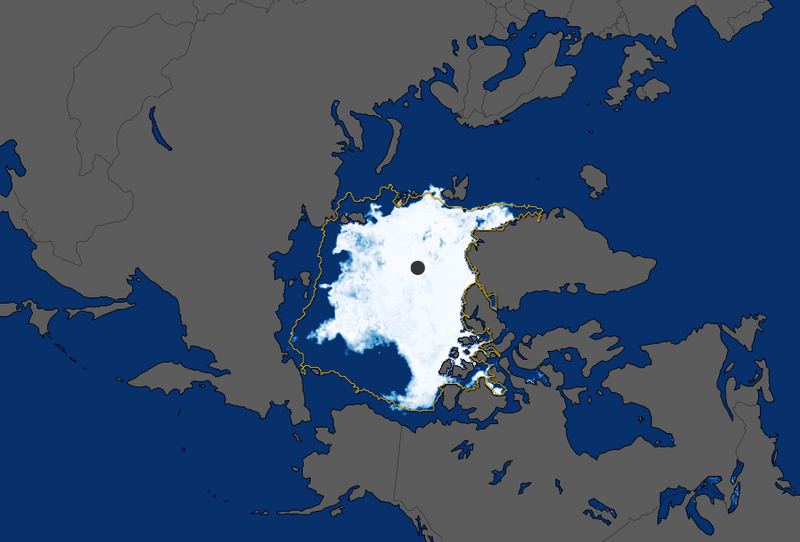 Arctic sea ice reaches annual minimum extent. Accessed September 18, 2009. Scott, M. (2009, April 20). Sea Ice. NASA’s Earth Observatory. Accessed September 18, 2009.